The infants who worked touchscreens like Beethoven on a piano are products of parents who played in the dirt. When it comes to the parents of Gen-Z students, it’s important to understand where they’re coming from and adapt your communications strategy so you’re talking to them, not at them. Here are some trends we’re seeing from the parents of Gen-Z students, along with some advice on how to reach the generation that survived the Cold War and multiple Ratt albums. You can see them hovering around their kids like plate spinners at the circus. We call the parents of Gen-Z students “helicopter” parents. They’re always there, waiting to fly in and settle injustices, protect from peanut contact and do whatever else their angels need. Why? In some cases, they never had a safety net so they’re overcompensating. Perhaps they’re fighting to protect their kids from the poor decisions they’ve made in their own lives. Or, according to research published in Psychology Today, they’re more afraid of failure than they are of peanuts. The reasons are not as important as the reality; these parents want to be involved in their child’s life. Give these parents a helicopter pad. 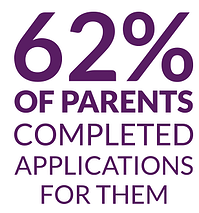 Invite them to be an active part of the admissions process by creating a separate section of your website for parents. Update your RFI form to ask for their email address and phone number, so you can email and text them about deadlines, financial aid and other topics of interest. Take advantage of the rare opportunity where someone can’t wait to hear from you. For more than 17 years, parents have fed their child, taught him or her to read and drive, had the talk, and meticulously provided. In many cases, parents have invested countless hours and dollars on lessons, tutors, apps and electronics. They want their investment to “pay off” with a fat envelope from the perfect college and they’ll do whatever they can to assure that happens. Understand why parents care so much about the college decision process (even though college choice doesn’t always make a significant difference in a child’s future). A parent’s fears may be unfounded, but just because you know there isn’t a clown waiting in your closet with a hammer doesn’t mean you can control your fear. Once you understand someone’s perspective, it’s easier to relate and communicate with them. It’s hard to leave the nest if no one kicks you out. They’re not exactly hanging out together outside of a Hot Topic, but Gen-Z students tend to be their parents’ best friends. The time parents spend with their kids makes it harder to cut the cord when they get to campus. You might know that everything is going to be alright, but it makes sense to empathize with someone who is watching their baby bird fall towards the earth. You can loosen the death grip by getting parents involved in the process. Start with an open line for questions or concerns. If they’re comfortable with you, they’ll be comfortable steering their child in your direction. Because parents are most involved (and influential) during sophomore and junior years of high school, be sure to reach out early to have the most impact. Our full report on parents covers everything from which topics are important to parents, to the most effective communications strategies for parents of Gen-Z students.